The Stewart PTH-5-1 will probably be the best tuning hammer you will ever tune with. Designed by the KineOptics design team, the Stewart Piano Tuning Hammer is made from aerospace materials and manufacturing techniques. 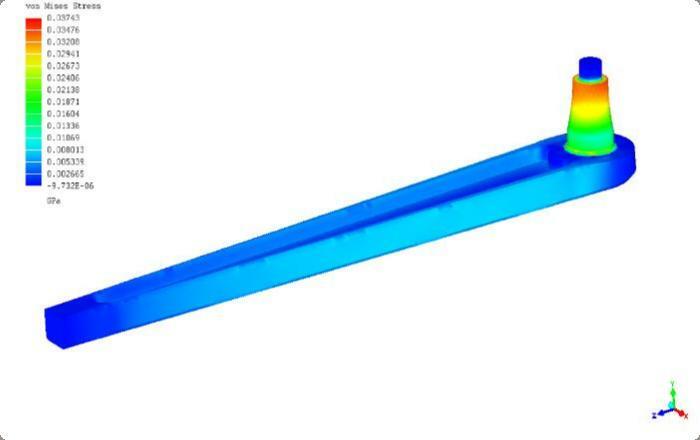 The Aluminum Arm and Titanium Torque Shaft have been extensively analyzed using modern Finite Element Analysis software for material dimensions and thickness for maximum stiffness with minimal weight. When held, the Tuning Hammer has a good feel and balance to minimize fatigue during those long tuning sessions. Our Tip is very special, being manufactured in our shop with a proprietary method that results in an extremely accurate and smooth internal square shape. This special design and manufacturing method will greatly reduce the marking of the piano tuning pegs. The fit is very good on the pins which adds to the solid feel while tuning. These tips are offered in sizes 1, 2, 3, and 4. NOTE: we are still working on the star feature geometry. Our current geometry fits quite well on some pins but not all. We might end up offering special tips for specific piano and pin brands if we determine this is best. We have observed that original Yamaha pins are different from some others. So we now offer our lever with not tip for this reason. The Titanium Torque Shaft projects 1 inch from the handle at a 5 degree angle. The Torque Shaft is set into the handle and located securely with an 8 sided modified spline and locked with a screw. 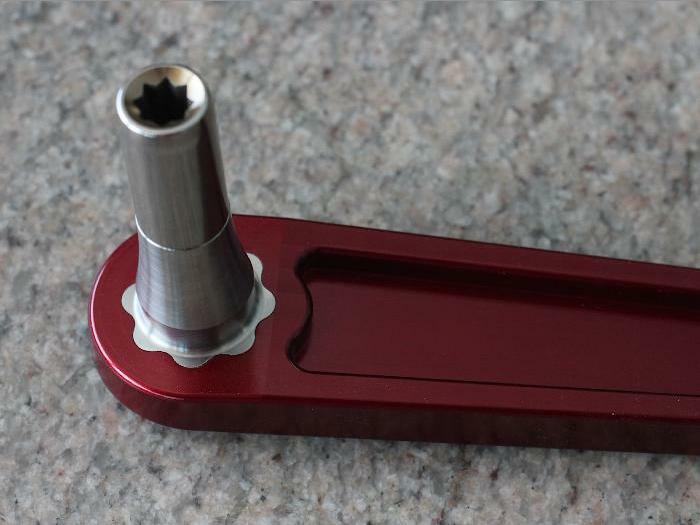 The Arm is CNC machined from aluminum and anodized a nice Dark Red. The I beam cross section was designed using Finite Element Analysis to reduce weight while keeping stiffness high. The Acetal Handle was designed to be comfortable in the hand and have maximum feel and control. The handle is machined out of Acetal engineering plastic and CNC machined in our shop. All parts including our special tip are designed using CAD software and machined with CNC machines in our shop in Sequim Washington. We might offer extended line of different variations in the future depending on demand. We offer a return policy, please ask. Ordering: Please contact us regarding your interest in the PTH-5-1. Please put PTH in the subject line to help us track orders. Include your address and what you would like to order. We will then calculate shipping cost and reply back. We can accept Checks and Paypal. Shipping: We normally ship UPS or USPS. The rectangular cross section of the Stewart PTH-5-1 provides positive rotational control when placing it on tuning pins. This design feature will speed up your tuning. is an interference fit and makes the two parts essentially one piece. This image is of two tips. The one on the left is the worst tip we have ever seen. The tip on the right is our tip, manufactured in Washington State. 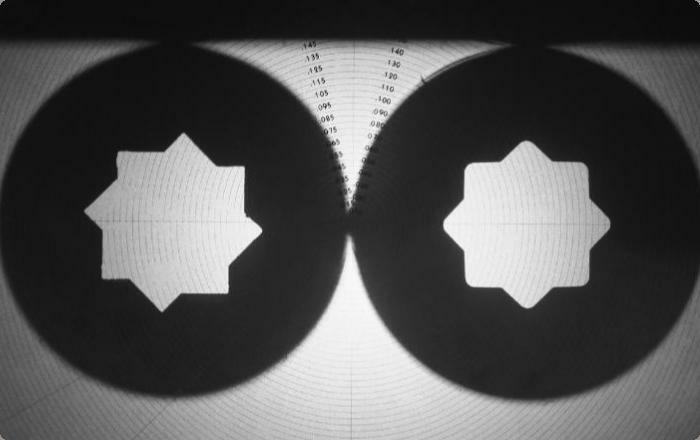 The image was taken in our J L profile projector. Notice the accurate profile of our tip and the rounded inside corners. This accurate, smooth profile will protect expensive tuning pins from marks. changes to achieve uniform stress of the PTH Arm I beam cross section. Notice the even stress, blue and cyan, of the handle lever. Notice how the stress increases as the diameter of the Titanium Torque Shaft decreases as it approaches the Tip. We have had some questions and here are the answers. 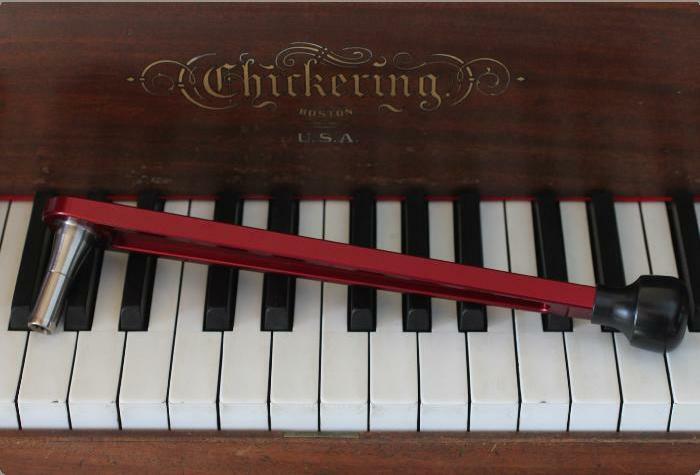 1: "Your tip looks great, but when tuning, it is an excellent fit on some piano pins, but a bit wobbly on other pins." Our tip is manufactured to very tight tolerances and we have made a QC gauge to test each one after manufacturing. The issue we have found is that there is variation in the piano tuning pins. There are several reasons which will result in a less than perfect fit. We have measured several of these variations and it is not just in the diameter or total angle of the square taper, but we have also measured a different angle and position of the square taper on each opposing pair of flats. This results in a tighter fit in one direction, but a bit loose 90 degrees to that. 2: "On a few pianos I have tuned with your lever, the large size of the handle head interferes with the case on a few pins." There is no way around that. To get the stiffness and keep the weight low, the large diameter of the head has to exist to lower the stress, thus keeping it feeling very stiff. The Stewart PTH will be able to access all but a few pins on most pianos. On most pianos, one will be able to tune every pin with the PTH. But to get to those few pins that are close to and edge, one will have to use a lever with a longer reach, thinner head, or a tip extension. But what the PTH will do is tune all but a few pins with a feel and speed that will reduce your tuning time and increase your precision. 3: "The lever is great and extremely stiff and light, but I have anodized aluminum parts on my bike and they get scratched up"
Yes, any anodized aluminum part will scratch and dent, but we needed to use aluminum to get the best balance between stiffness and weight. If you are like us and take pride in our tools, you can wrap the handle with some self adhering stretch tape. This is also recommended when one wants to protect the paint on the plate and any other surface on the piano that could be damaged accidentally from the hammer. 4: "Will other tips fit on your lever? Yes, as far as we know, every other tip we tried fits on our threads.